Tuscan-style steak and other Italian classics form an extensive menu. 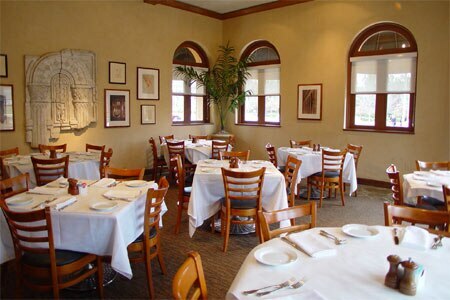 : Brio Tuscan Grille’s extensive menu spans the Italian kitchen’s repertoire. Appetizers to share include bruschette and flatbreads, while pasta dishes like mushroom ravioli are all substantial in portion, so a single serving is plenty for two, especially as an appetizer. Although the pasta is not cooked al dente, the flavors are nice and the sauces are rich. For lunch, grab a panino. Simple is best if ordering a steak. The pair of filets with Romano-crusted tomatoes and hollandaise sauce bests the Gorgonzola-crusted steak, for instance, which loses the taste of the cheese while contributing an unfortunate bitterness to the meat. Desserts are ho-hum --- we suggest the chocolate bread pudding. The wine list offers American and Italian selections, but not much is inspiring. Happy hour at the bar runs Mon.-Fri. from 3 p.m.-7 p.m., and from 9 p.m. to closing with drink and appetizer specials. Also located at 2964 Peachtree Rd. NW, Atlanta, 404-601-5555.